My family drinks a lot of water and there are always empty water bottles on my counter so the Rubbermaid Hidden Recycler is a great addition to my kitchen. Easy attachment to a cabinet door with hooks included with the product or screws. A convenient handle allows the bag to easily be transported to wherever your recycling is stored for pick-up or transport. A 5 gallon bag that holds up to 36 12-ounce cans and can fit a milk jug. The bag has a leak-proof liner and is machine washable to make it easy to clean after any unexpected spills. The bag is soft-sided allowing for flexibility inside any cabinet. The bag and all packaging is made from recyclable material, and the product is recyclable. The Recycler was easy to install and no tools were needed but you can permanently install the recycler with screws(not included). The instructions were easy to follow and I used the hooks that were supplied. I was afraid it would be bulky and not fit into the cabinet with all of the stuff stored under the cabinet but it fit fine. No more empty water or milk containers on my counter. Everyone in my family are using the recycler and I make less trips out to the garage. I spilled some soda in the bag and it was very easy to clean. This is great for any household and is reasonably priced. Follow Rubbermaid on Twitter or Facebook and visit their Adventures in Organization Blog. 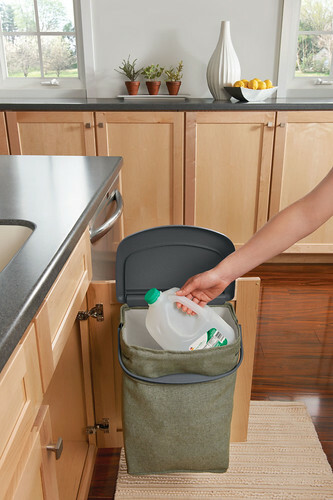 You can purchase the Rubbermaid Hidden Recycler at Rubbermaid.com. Would you like to win a Rubbermaid Hidden Recycler? Enter via Rafflecopter. 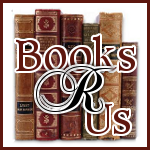 Contest ends on 4/29/12 @11:59PM EST and is open to USA/CAN only. See rules on Rafflecopter. I was given a free Rubbermaid Hidden Recycler for my honest opinion and I was not compensated for my review. we recycle our aluminum cans!